Maria's arm and racket rotate only halfway through the motion. What's wrong with Maria Sharapova's serve? It's the rotation of the hand, arm and racket in the upward swing--or more precisely the inconsistency and the lack of that rotation. Top servers rotate the arm completely through the motion on every serve. Maria doesn't. Her actual rotation is usually about half what it needs to be. It's that simple. What is hand, arm and racket rotation? From the racket drop to the contact and out into the followthrough, the edge of the racket turns over roughly 180 degrees. This means that as the racket travels outward into the followthrough, the racket edge rotates counterclockwise until it is perpendicular to the court. It's turned completely over. Compare this to Maria. On most serves, her rotation stops with the racket facing downward, basically parallel to the court--half what is normal is good serving. Sometimes Maria does complete the rotation, in fact, on around half of her first serves. But on her second serves--the source of her double faults--the percentage is much lower, more like 10 or 20%. So the fact is that on the majority of the serves she strikes, a critical biomechanical element is missing. Why is this rotation after contact so important? Isn't the ball already off the strings? Compare Maria's arm rotation to Roger's. The full rotation in the followthrough is the consequence of the acceleration of the racket into contact. If this critical motion stops dead at the hit, the acceleration going into the contact is substantially less. Although we can't measure it, it may actually be slowing down. A good analogy is the followthrough on the groundstrokes. Swinging freely all the way through the motion is what maximizes the racket speed at the critical moment the racket strikes the ball. Obviously, Maria's win in the French Open was an amazing achievement. But it's not a revelation to say that her serve was a liability that she had to overcome in her path to victory. Given her technical limitations it's amazing how effective her serve actually is--when it goes in. But the inconsistency in the motion and the outcome has got to cause anxiety and uncertainty even for someone as mentally tough as Maria. In the final of the French she hit 12 double faults. In most close pro matches the difference in the number total points won is a lot less than that. It's hard to imagine her beating Serena Williams if she gives away 2 or 3 times the normal point differential in a close much. It would be very interesting to see how much of a weapon Maria's serve could actually be if she made this simple adjustment. And whether it could actually make a difference against her biggest rival. 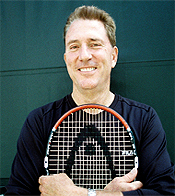 Watch the upper arm rotate and then drive the hand, forearm, and racket as a unit after the elbow straightens. Although it's not accurate from the biomechanical point of view, this rotation is often called "pronation" in coaching lexicon. Pronation actually refers to a different rotation--the independent rotation of the forearm at the elbow. That doesn't occur in the serve because the upper and lower arm rotate as a unit. But if the term is used in association with the full, correct motion and the player serves well, who really cares? It's a matter of technique not terminology. Still it can be valuable to understand what is happening more accurately. The correct rotation is initially driven by the rotation of the upper arm in the shoulder joint, but once the elbow straightens out it also includes the unitary rotation of the forearm, hand and racket. Again, this is a basic element in a sound service motion and a primary contributor to racket head speed. This means it is critical in generating both ball velocity and spin. Multiple TV commentators have expounded on the "problems" in Sharapova's serve. We have heard that it's her "low elbow" position in the wind up, which is reducing racket speed. Maria has an excellent racket drop and explodes upward and forward. This is unlikely, at best minor and almost completely irrelevant considering the larger problems. As our 3D studies have shown (Click Here), the critical acceleration of the racket occurs after players reach the racket drop position, and Maria gets to a great racket drop position. We have heard from a former Grand Slam champion that Maria needs to go "up" to the ball. But Maria has a good knee bend and explodes off the court with a lot of air and a landing inside the baseline. Why hasn't this problem been diagnosed by these great tennis minds? The reason is you can't see things that are invisible. You can't understand what you can't see. The full rotation of the hand and arm after contact takes place in a 1/10th of second or less That's far too fast for the naked eye to register. The only way to really see what is happening is through frame by frame analysis of high speed video. Furthermore, as with any technical issue, you need to study a sizeable number of examples. Not one or two, but dozens. Ironically it's a simple adjustment, even for club players. I know because I have helped dozens of players make it. Recently we've looked at the critical role this rotation plays in high level serving, in generating spin and in controlling placement. (Click Here.) But Maria isn't a Tennisplayer subscriber. At least not yet. Maria should project a mental image of the rotation and then let the racket flow outward over the image. So how specifically would she do it? It wouldn't be hard. As noted there are at least some serves where she does complete the rotation. Maria needs to see the difference on video. She needs to see herself make the full rotation. She needs to see herself when she doesn't. Then she needs to physically model the position in her motion when she reaches that full rotation. Close her eyes. Visualize it in detail how the position looks inside her mind and how it feels. Now use that image as a mental blueprint. Start serving and visualize the fully rotated position with her mind's eye. Let the racket pass through that image. Look at herself on high speed video to see if or how much she has moved toward the model position. Repeat this process until the motion consistently conforms to the model. My prediction is that within a short period she would notice she is hitting with more pace, more spin, and that the image works like magic to keep the ball in the court. Confidence will be the automatic consequence. The next step would be to try it in points, again monitoring it in high speed video. When she feels truly confident doing this, you know what? It's time to unleash it in match play. What are the chances of this change actually happening? Her coach Sven Groenefeld is a Tennisplayer contributor. So I am sending him this article. Will anything happen? Stay Tuned.